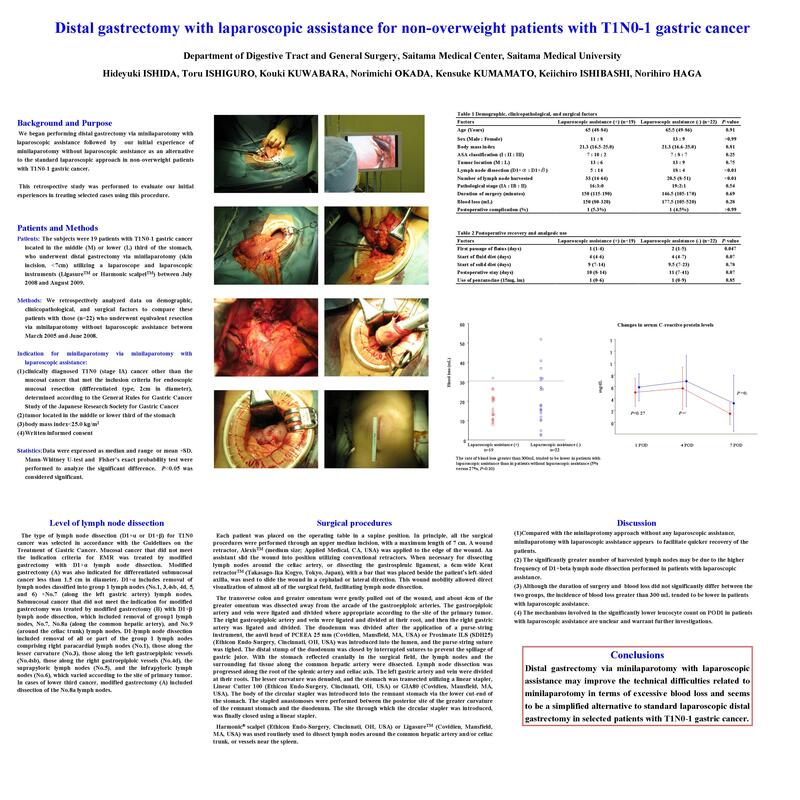 Background and Purpose: We began to perform distal gastrectomy via minilaparotomy with laparoscopic assistance in non-overweight patients with T1N0 gastric cancer as an alternative to the standard laparoscopic approach. This retrospective study was performed to evaluate our initial experiences treating cases by this procedure. Patients and Methods: The subjects were 16 patients with T1N0 gastric cancer located in the middle (M) or lower (L) third of the stomach, who underwent distal gastrectomy via minilaparotomy (skin incision, <7cm) utilizing a laparoscope and laparoscopic instruments (Ligasure or Harmonic scalpel) between July 2008 and August 2009. We retrospectively analyzed data on clinicopathological factors and surgical outcome in this series. In addition, the duration of surgery and blood loss were compared between these patients and those (n=27) who underwent distal gastrectomy via minilaparotomy without laparoscopic assistance between April 2005 and June 2008. Results: Patient ages ranged from 46 to 71 years (median, 64 years). The male:female ratio was to 9: 7. The body mass index was 16.5-24.5 (median, 21.3) kg/m2. The sites of primary tumor were M in and L in 11. The types of surgery were D1+arufa in three and D1+beta in 13. Pathological stage was stage IA in 14 and stage II in two. The duration of surgery ranged from 115-170 (median, 142.5) min and estimated blood loss ranged from 80-320 (median, 135) mL. The duration of surgery and blood loss did not significantly differ between two groups. However, the frequency of greater blood loss (>250 mL) tended to be lower in patients with laparoscopic assistance (6% versus 33%, p=0.06). Conclusions: Distal gastrectomy via minilaparotomy with laparoscopic assistance may improve the technical difficulties related to minilaparotomy and seems to be a simplified alternative to standard laparoscopic distal gastrectomy in selected patients with T1N0 gastric cancer.